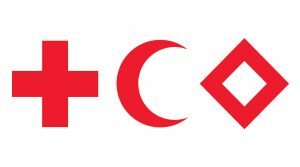 The Red Cross was started in the middle of the 19th Century by Swiss businessman Henry Dunant. He was very upset about the many injured soldiers on both sides of the battle of Solferino who were left to die due to lack of care. Today the Red Cross helps anyone, anywhere in the UK and around the world to get the support they need if crisis strikes. It can be recognised by 3 different logos, a cross, a crescent and a crystal. The headquarters of the Red Cross are in Geneva, Switzerland. Tonight we had demonstration and discussion of basic first aid, based on the training manual published by Dorling Kindersley Ltd, 22 Jun 2016. 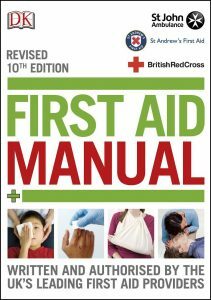 This manual is also used by the St.John Ambulance and St. Andrew’s First Aid. Sandra showed us how to do CPR (30 compressions, then 2 breaths) and how to use a defibrillator machine, which is easier to use than we all thought. The machine will shout out instructions and therefore you cannot go wrong. This should always be done on the floor. We also discussed how to deal with deep cuts, burns and nose bleeds.